How do I know that the A/W season is right around the corner? I start to get these typically seasonal cravings, which ultimately has already led to me baking cookies, stocking up on canned pumpkin and keeping my little jar of cinnamon close-by the coffee maker. Another one of those cravings is - you guessed it! - quiche. Why? Because it's always been my Mum's go-to vegetarian meal for New Year's Eve, it's super easy to make and yummy at the same time (you can just throw in all your favourite veggies, what's not to like? ), and well... There's just something quite rainy weather-y about them, isn't there? 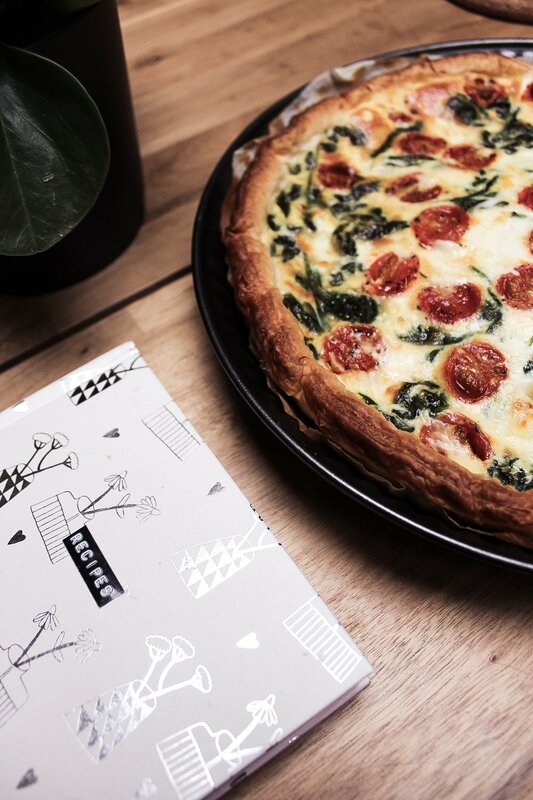 Craving some delish quiche as well? Then click through for one of my favourite, super simple recipes! 2. Heat up some olive oil in a skillet and add the spinach. Keep stirring until it's completely shrunken the way spinach does so magnificently fast. Spinach is life. Or is that just me? 3) Spread out the pie crust in its tray and add the spinach. Spread it out evenly. Chop the mozzarella and add it as well, along with the roasted tomatoes. 4) Mix the eggs, cream and milk with a bit of salt and pepper. If you're beating it by hand, make sure to do so for at least 2 minutes because you want this mix light and fluffy. Using a mixer? One minute will do fine. Pour the mix into the pie crust, rearrange your veggies if necessary, put the whole thing into the oven and bake for 35 to 45 minutes. And there you have it, a perfectly easy and yummy quiche! Perfect for dinner, and easy to take to work or even have a slice of for breakfast the next day! Do you have any typical A/W cravings? What are they?